They key to this dish is to make the ingredients uniform in size that way the cooking times don’t vary too much and, well, it looks prettier! The first thing you want to do is crisp up your turkey bacon. Because I was only using 2 slices in this whole dish, I diced them pretty small. This also helped set the standard for the rest of the ingredient sizes. 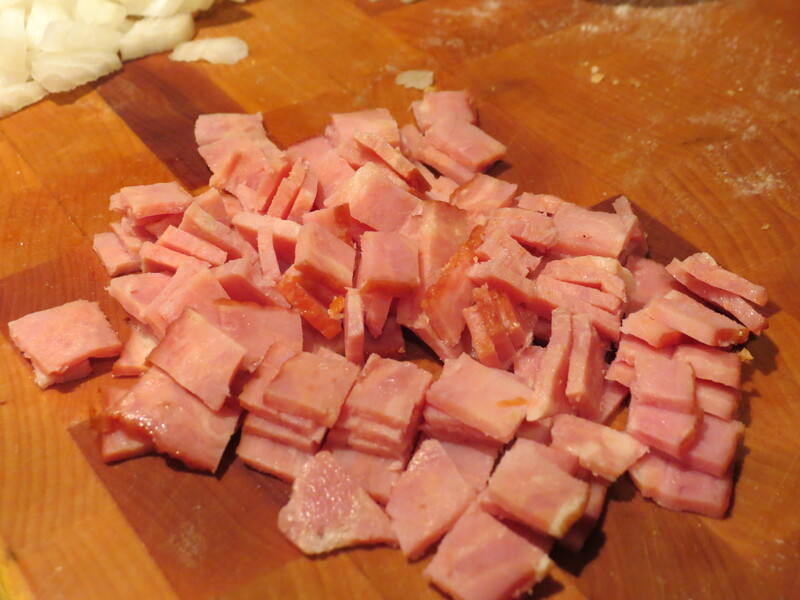 In order to crisp up the bacon, add your small pieces to a dry pan set over medium high heat. Try to keep the bacon in one layer as much as possible. After a few minutes, you will start to hear the bacon sizzling. Stir up the bacon so that you crisp up both sides without burning it. This process should take about 5-7 minutes total. This process may also cause your family members to be drawn to the kitchen and shout the phrase “OMG Bacon!” Once your bacon is nicely crisped, take out of the pan and set aside. If you were using real bacon, you would have some grease in the pan and would not need to add butter. But since turkey bacon is not particularly greasy (but is amazingly delicious), I added butter at this point, along with my finely diced onions and equally finely diced potatoes. 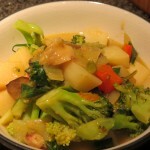 At this point I also added the herbs de provence (what a convenient herb blend) along with the vegetable broth. I know I mentioned that there’s not a lot of liquid in this dish, and there isn’t, but I needed the vegetable broth to help cook my potatoes just to the point of being delicious (and not to the point of being raw potatoes). 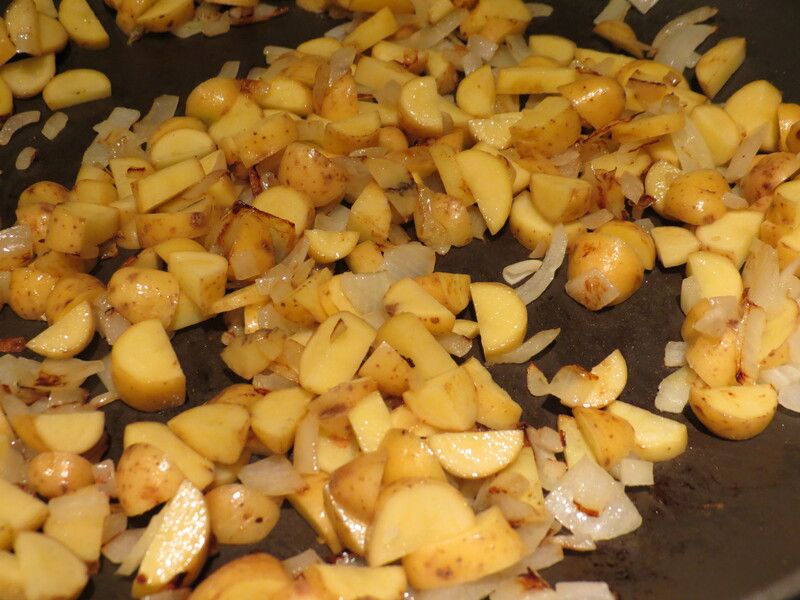 The potatoes and onions will take the longest to cook, so that’s why I started them first in the pan. While they were cooking I prepared my mushrooms (by rough chopping them into small pieces) and my bell pepper, by finely dicing it. After about 10 minutes of the onions and potatoes cooking, I added in the mushrooms and the Worcestershire sauce. Now, the rest of the dish finishes up pretty quickly, since bell peppers, spinach, and broccoli slaw don’t need much time on the heat. 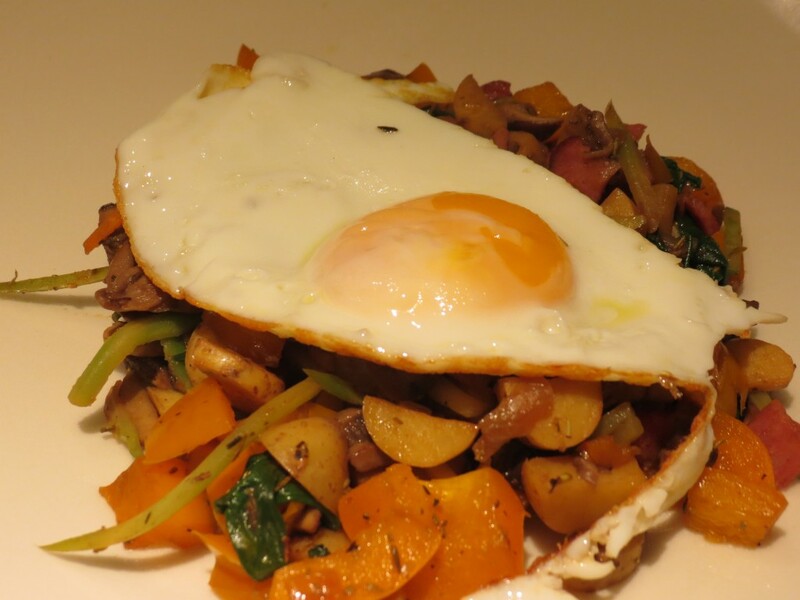 So if you were planning to serve your hash with a nice fried (or poached) egg on top (which you should, it’s delicious! 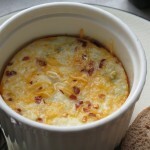 ), now would be the time to start heating up a pan for your eggs. 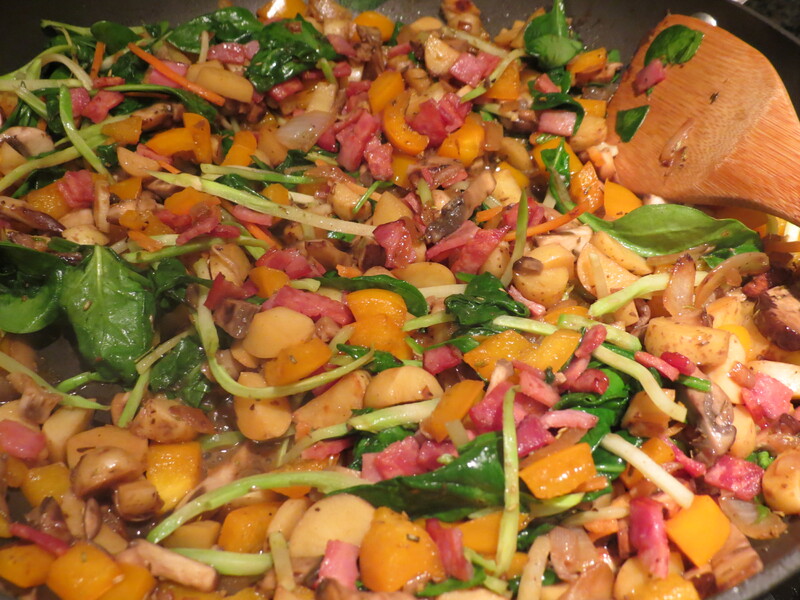 Once your mushrooms are nice and brown, and your potatoes are cooked, but not mushy, add in the bell peppers, spinach, and broccoli slaw and stir so all the ingredients mix well and your creation starts to look really colorful! 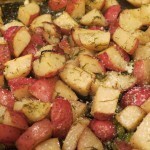 At this point you’ll want to taste your dish for seasoning and to make sure the vegetables are cooked to your liking. Finally, add your turkey bacon back to the pan for about a minute while it re-heats. At this point your family will likely have commented on how delicious everything smells and may be encroaching on your kitchen wondering when it will be ready. These are all good signs! This makes 3 large servings. I served the hash with 1 fried egg over the top so that the yolk created it’s own extra sauce. It was a big hit– a nice savory, hearty meal with a lot of herby notes and just a touch of creaminess from the egg, though next time I think I will poach the eggs to keep as much runny yolk as possible. This is a pretty universal recipe, and I’ve suggested some substitutions in the ingredient list above, but really you can feel free to see what inspires you in your fridge! Let me know what ingredients inspire you! 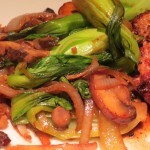 This entry was posted in Anytime, Brunch, Dinner by michcorbett. Bookmark the permalink.